April 29, 2013 – Performing arts presenting generates a wide range of benefits for Canadians, the communities they live in and society at large, according to a report prepared by Strategic Moves and released today by the Canadian Arts Presenting Association (CAPACOA). 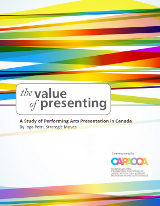 The Value of Presenting: A Study of Performing Arts Presentation in Canada includes a comprehensive historical and contemporary overview of the performing arts ecosystem. It reveals that performing arts are valued by the vast majority of Canadians – across socio-economic differences – and it provides a new perspective on younger Canadians’ interest in live performing arts. 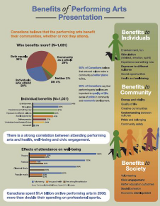 Most importantly, the study identifies a broad range of public benefits associated with performing arts presentation, including better health and well-being, greater energy and vitality in communities, and a more caring and cohesive society. “This study has been enlightening for all the participants: it shed a new light on the multifaceted role of the presenter within the broader society and it has opened new avenues for benefits-based collaboration,” declared Phyllis Stenson, executive director of the Harrison Festival Society and CAPACOA board president. “At long last, we have a study and stories to reflect back to us why presenting professional performing arts matters to our communities and to the generations of Canadians to come,” added Warren Garrett, executive director of CCI – Ontario Presenting Network, and member of the study’s advisory committee. 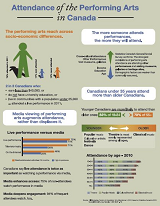 Canadians value the performing arts, with 3 in 4 reporting attending a wide range of live events. Canadians volunteer in the performing arts: for each paid staff member, there are 17 volunteers giving their time to performing arts presenting organizations. Media viewing of performing arts doesn’t replace live attendance; it supplements it. Canadians are twice as likely to ascribe a high importance to live performing arts attendance than to any media-based viewing. Canadians attend events predominantly in specialized performing arts facilities and outdoor venues, and most say these facilities are important to the quality of life in their communities. Canadians believe that the presentation of performing arts equally benefits the individual who attends and the community as a whole. For Canadians, the highest-rated benefits of the performing arts in their communities are energy and vitality along with improved quality of life, and a more creative community. There are more than 1,400 presenting organizations of all types in Canada: volunteer presenters and professionally-run organizations, based in a purpose-built theatre or operating in non-specialized venues, presenting festivals and series of performances, specialized in a single artistic form or presenting several disciplines such as music, theatre, dance, comedy and storytelling. Comment the report on our blog or on our Facebook page. This study was commissioned by the Canadian Arts Presenting Association (CAPACOA), in partnership with other presenting networks and an advisory committee of sector representatives. Research activities were carried between May 2011 and January 2013 by Strategic Moves. They involved consultations with more than 1,000 stakeholders, and two surveys conducted in collaboration with EKOS Research Associates. This project was made possible with the financial support of the Canada Council for the Arts, the government of Ontario, the Ontario Arts Council, the government of Nova Scotia and the Saskatchewan Arts Board. A study prepared for the City of Vancouver, the City of Calgary, the City of Toronto, the City of Ottawa and the Ville de Montréal. By Kelly Hill, Hill Strategies Research, January 2012. This report compares the cultural investment in five of Canada’s largest cities: Vancouver, Calgary, Toronto, Ottawa and Montréal. This report is the product of a collaborative effort between cultural staff members in the five large cities, a collaboration that was made possible thanks to the work of the Creative City Network of Canada. In partnering with the ACE Communities project, the CCNC has begun to develop original resources and is looking at strategies to replicate the 'ACE' approach across the country. The CCNC has conducted a literature review of existing and original research to identify 'best practices' in rural communities.